For many guides and outfitters throughout the Rockies, a common question from clients is about hunting at high altitude. Hunting Montana’s high country is an amazing experience. 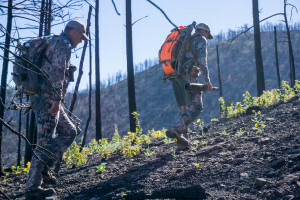 But pursuing game like elk, mule deer or sheep through steep terrain can be a challenge, even for a fit hunter. 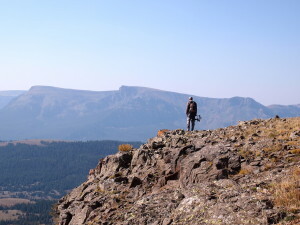 Here are five basic things you should know about hunting at altitude. One of the best things you can do to avoid issues on a high altitude hunt is to be in the best shape possible. Don’t cram in exercises during the last few weeks before the hunt. Instead, start early and gradually work yourself into shape over the next few months. Focus your workouts on leg strength, core strength and cardiovascular conditioning. Getting your body ready ahead of time will directly affect your enjoyment and success on the hunt. On the way to your hunting camp or lodge, spend a day relaxing in a nearby mountain town to help your body acclimatize gradually. Go for an easy walk, do some sightseeing and allow your system to adjust. Unfortunately, taking an extra day may not be easy since most of us have limited vacation time. If that is the case, make sure you don’t push yourself to your physical limit on the first day of the hunt. Guides are usually aware of this, and will help you accordingly. By the end of the hunt you should be tired. Just don’t wear yourself too thin on the first day. At least 24 hours before your hunt, begin drinking plenty of water. Then while you’re on the mountain, staying hydrated is perhaps the most important thing you can do. Don’t wait until you are thirsty. Slowly sip from your water supply all day long. The Rocky Mountain climate in many areas is extremely dry. Because of that, some guides recommend that hunters carry at least two liters per person each day. Depending on where you are, refilling bottles during the day may be a possibility. Be sure to ask your guide what to expect. In order to keep your body hydrated, I also recommend limiting your caffeine and alcohol intake. Enjoy that morning cup of coffee, but limit yourself to one cup. Remember that coffee and alcohol are diuretics. A little may not hurt, but don’t overdo it. Altitude has a tendency to suppress hunger, but with your body working overtime, you’ll need the extra calories. Consume plenty of carbohydrates and try not to go long periods without snacking. Bring plenty of lunch items and snacks to sustain you throughout the day. Whenever you and your guide stop for a break, munch on a cereal bar or crackers and drink some water. Eating a little bit every couple of hours will help keep your energy up and fight off altitude headaches. Finally, get plenty of rest. This is not always easy on a multi-day western hunt. You may be up at 4 a.m. and back to camp well after dark. During the early archery and muzzleloader seasons, this can make for very long days and short nights. Try and rest in the middle of the afternoon when you’re out in the field. Even a short nap can make a big difference in how you feel. High altitude environments can be some of the most beautiful and exciting places to hunt. Most people only experience very minor symptoms if any. By watching these five factors, the altitude should have very little impact on your hunt. You may feel a little more tired than normal, but when it comes to pursuing game in the mountains, that’s to be expected.